Black Galaxy Granite Countertops The Original and still continuing to be the best! We have been producing granite countertops since the early 1990s and have produced in excess of 400,000+ linear metres...that's a lot of kitchens! We were the first Indian company to achieve successful quantity granite countertop production and perceptive wholesale purchasers and project specifiers worldwide appreciate our commitment to the highest quality production. You can view our Black Galaxy granite quarry here. It is important to note that we maximise the production from every block by shipping free length worktop strips with a minimum length of 2400mm (94.5") up to usually a maximum of 3200mm (126"). If your requirement is for fixed-length strips the cost will be higher since we shall inevitably have more waste than usual. 600~700 mm granite countertop strips are packed ten to a crate. 2400+ x 600 x 30 mm (94.5"+ x 23.6" x 1.18") Polished top surface & all four edges with pencil bevel/eased edge. 2400+ x 110 x 20 mm (94.5"+ x 4" x 0.75") Polished top surface, one long edge & two ends with pencil bevel. Very occasionally extra long slabs are available, the largest we have ever shipped were 4500 mm (177.2"/14.75ft) in length! Q1. Black Galaxy Premium/First Choice : Granite clean of any visible veining. Q2. Black Galaxy Classic/Standard : Granite with one or two visible veins, mergeable lines. Q3. Black Galaxy Commercial : Granite with two or more visible veins, mergeable lines. It is important to note that there is a limited quantity of Premium Galaxy granite available, the vast majority of countertops/slabs shipped by ALL processors is of the Classic Galaxy granite. Classic is lower in cost than Premium. These lines do not affect the integrity of the material and quite often cannot even be seen except from a specific viewing angle or under very bright lights, certainly, insofar as a large area of flooring for a shopping mall is concerned, our Black Galaxy Classic Granite is acceptable and appreciated. All our granite countertop and slab production is independently inspected with their report emailed direct to the buyer prior to shipment approval. 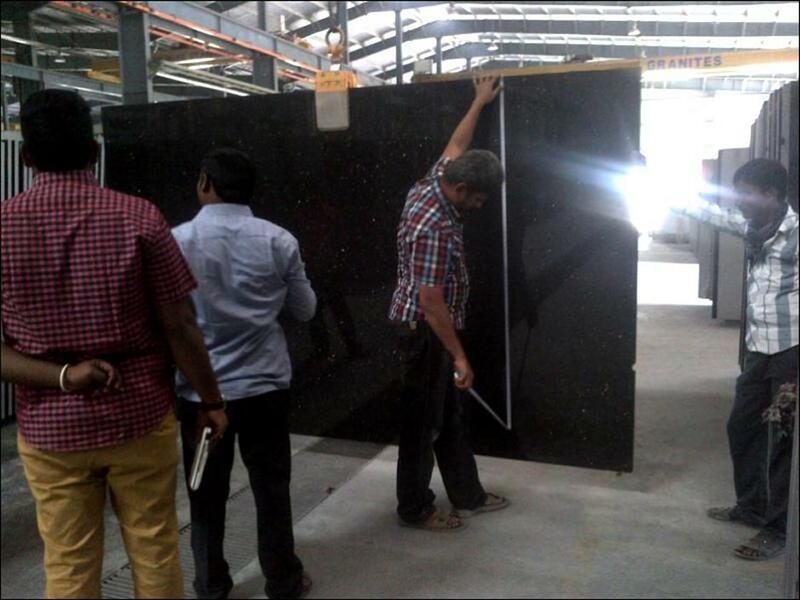 The image to the right shows the QC (Quality Control) Inspector measuring large Premium Black Galaxy granite random slabs prior to crating and shipment to the customer. Please click on the image to enlargen. Black Galaxy slabs are available in many different dimensioned sizes and a massive cost saving can be made by shipping smaller sizes already prefabricated for project supplies or in much more manageable cutter strips which can then be processed on-site with much smaller trimming saws. As yet we have still not discovered anything better than traditional wooden crates for shipping in a container. Each crate is custom-made since free-length worktop strips dictate this method. The crates are suitable for outside storage until needed. All containers are fumigated after loading therefore you should not receive any unwanted surprises.